This beautiful "L" shaped desk will be a wonderful addition to your home office. 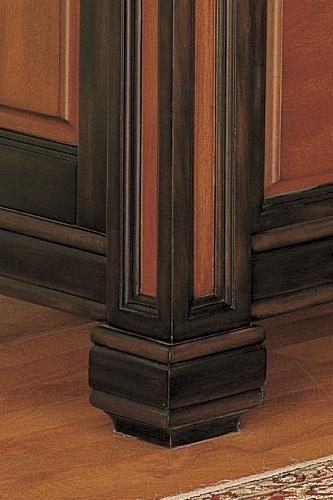 A classic style in a warm two tone finish will brighten your room, offering simple shaped molding trim, and pretty block feet. With a pedestal on each end, this desk has lots of storage space. Five spacious storage drawers and file storage will meet your home office needs, with a center keyboard drop front drawer for simple computer use. It also features a a power strip. Bold metal hardware accents this piece, for a perfect finishing touch. Add this classic desk unit to your office for a calming and functional space where you can really get things done.